This item is a work of the U.S. federal government and not protected by copyright pursuant to 17 U.S.C. Â§105. I -,F'I fi11 -O C0FJT IIriE T T L EI. I E-E. AuIC;IJ. :T I,.' 1'?14. East, across Atlantic and Pacific, has been a world obsession. sands of lives have been lost in the efforts. August 15, 1914, the Panama Canal was opened to commerce. the canal that distance is reduced to less than 44 miles. 8 OFFICIAL HANDBOOK OF PANAMA CANAL. ports is two-fifths what it used to be. over a month at sea on each voyage from coast to coast. miles or 39 per cent of the former distance. lations of distances are given in the appended tables. United States and Pacific ports, American and foreign. more. folk. ton. nah. ille. Difference between routes via Panama. via Suez, Colombo, and Singapore. 1 Distance less via Suez. stance. Panama. tance. Panama. tance. Panama. tance. anama. Pacific ports, American and foreign. S. S. CRISTOBAL CROSSING LINE OF OLD FRENCH CANAL ON WAY TO GATUN, AUGUST 3, 1914.
the canal is one of the simplest matters in all his business. as soon as the vessel has cleared from the canal. OFFICIAL HANDBOOK OF PANAMA CANAL. being secured to the Government by its tenure of the bonds. companies having frequent sailings through the canal. credit, to apply on future bills. important is to provide the money to pay the ship's bills. 18 OFFICIAL HANDBOOK OF PANAMA CANAL. canal whenever it is ready. ping to discharge cargo or passengers at the terminal ports. the vessel, except when she is passing through the locks. cooperation from the several points of control. GATUN LOWER LOCKS, LOOKING NORTH FROM MIDDLE LOCKS, MAY 6, 1913.
locks, put direct to sea without further stop. ing locomotives on the approach wall. the prompt paying out and taking in of hawser as required. service to vessels of less than 15,000 gross tonnage. delays and expenses of vessels passing through it. by the end of 1915.
to ships at the rate of 1,200 barrels per hour to each vessel. crane at the coal wharf at the Atlantic entrance. systems and has been purified. GATUN SPILLWAY DAM. OPENING OF SEVEN GATES, LOOKING WEST FROM EAST ABUTMENT, DECEMBER 30, 1913. 24 OFFICIAL HANDBOOK OF PANAMA CANAL. compare favorably with prices in any port of the world. obtainable in the markets of the world. Ice may be purchased in any reasonable quantity. least two days for the work. as well as brass castings of any ordinary size. vessel that can pass through the canal. have been erected and are practically ready for service. cover overhead expenses, prescribed by The Panama Canal. 26 OFFICIAL HANDBOOK OF PANAMA CANAL. METHOD OF APPLICATION FOR SUPPLIES. on a businesslike basis without unnecessary delay or red tape. tion to clearing ship, etc. Balboa the price is $1 more per ton, either form of delivery. Fuel oil.-Regular sales, $1.25 per barrel. be obtained from the offices of the port captains. sheets, tablecloths, napkins, towels, 1 cent each. over, 90 cents per hour; under 400 tons, 30 cents per hour. in connection with handling freight and cargo. tion thereof, per foot of length, measured over all, 12 cents. feet, per foot, 12- cents. $18 for each subsequent day. hour, and $2.50 for each succeeding hour. 28 OFFICIAL I-IANDBOOK OF PANAMA CANAL. without affecting the status of the vessel in this respect. ships, and supply ships, per displacement ton, 50 cents. vessels, per net ton, $1.20. on the space occupied; per net vessel ton, $1.20. OPENING OF THE PANAMA CANAL. S. S. ANCON IN GAILLARD CUT, LOOKING NORTH FROM CERRO LUISA, AUGUST 15, 1914.
of goods is in most cases an appreciable consideration. operation. All cases can not be covered by exact formula. tons of raw cotton, is typical. days on the outward voyage alone. by the rules of measurement of the British Board of Trade. may be approximated at $230 per day on this route. alent amount would have been collected at the Suez Canal. least $3,258.40 more than the use of the canal route. speed of 10 knots, the saving in time at sea was 23 days. 32 OFFICIAL HANDBOOK OF PANAMA CANAL. saving of approximately $3,808 per voyage. will be introduced into some of the more important routes. 34 OFFICIAL HANDBOOK OF PANAMA CANAL. vessel, as measured for United States registry. GENERAL VIEW OF PEDRO MIGUEL LOCKS FROM LUISA HILL, JUNE 6, 1914. 36 OFFICIAL HANDBOOK OF PANAMA CANAL. and there are no complicated tariffs. sessed on loaded barges towed through the canal by tugs. through the caiial amounted to $1.118 per ton of cargo. the total expenses prorate at 78 cents per ton. 75 cents per ton of cargo carried. 38 OFFICIAL HANDBOOK OF PANAMA CANAL. routes around the Horn or the Cape of Good Hope. York and the Isthmus may be approximated at 20 days. -may generally expect a fair wind for entering. given, tugs may be obtained from the canal authorities. days from October to April. be rated at 120 days; by way of the Horn about 250 days. 40 OFFICIAL HANDBOOK OF PANAMA CANAL. at sea, which, at $75 per day, is equivalent to $1,050. THE CANAL AND THE NAVY. and the center of the Atlantic coast in 5 days. of the Government to another. divide, and the valley of the Rio Grande on the Pacific slope. the President dated April 27, 1915. LOOKING SOUTH FROM CONTROL HOUSE, APRIL 8, 1914. 44 OFFICIAL HANDBOOK OF PANAMA CANAL. vessels between the levels mentioned. from Gaillard Cut to date. end is 808 feet long, being in the form of an arc of a circle. consumption and evaporation are in excess of the supply. 46 OFFICIAL HANDBOOK OF PANAMA CANAL. and decreases silting to a minimum. Cut has caused similar breaks even in ordinarily firm rock. is accordingly 40 feet above sea level. HILL ON LEFT, JUNE, 1913. 48 OFFICIAL HANDBOOK OF PANAMA CANAL. locks of concrete and gates of steel. Pacific, the figure given being for mean tide. there is always a minimum depth over the gate sill of 45 feet. MIRAFLORES LOWER LOCKS. LOWER MAIN GATES, JULY 5, 1913. 50 OFFICIAL HANDBOOK OF PANAMA CANAL. verts are controlled by valves. are necessary on account of tidal conditions. over four great trade routes. 52 OFFICIAL HANDBOOK OF PANAMA CANAL. small lots of various articles." Atlantic coast of the United States to the Pacific coast. one time in the traffic in grain. 54 OFFICIAL HANDBOOK OF PANAMA CANAL. rattan, bamboo, silk, tallow, tea, wool, etc. vessels passing through the canal during its first half year. ing coal to undeclared destinations. Coal, all moving to the Pacific, amounted to 151,745 tons. 56 OFFICIAL HANDBOOK OF PANAMA CANAL. canal was consigned to Japan. over 5,000,000 tons a year. in a month almost as much as the railroad did during a year. 58 OFFICIAi r ANDjIOOK OF ( PANAMA CANAL. several hundred miles of train to spare. through the canal Ihad an average of 5.040 tons of cargo. the average load on each ship going through the canal. S a spe 0 "
C AA # I t .
OFFICIAL HANDBOOK 'l;Zr OF THE, PANAMA CANAL 1915 S.S. ANCON PASSING CONTINENTAL DIVIDE, AUGUST 15, 1914. OFFICIAL HANDBOOK OF PANAMA CANAL. 9 4,139 miles; and to Guavaquil bv 7,405 miles. Froim New York to Guayaquil the present distance of 2,765 miles is approximately 27 per cent of the former distance-10,270 miles. As to the Far East, New York is nearer to Yokohama by 3,768 miles than formerly by way of the Suez Canal, but the latter route is 18 miles shorter than the Panama route for vessels plying between New York and Hongkong. New York is 41 miles nearer Manila bv Panama than by Suez, and 3,932 miles nearer Sydney by Panama. New York is now, by virtue of the Panama Canal, nearer than Liverpool to Yokohama by 1,880 miles, and nearer than Liverpool to Sydney by 2,424 miles. The foregoing are typical instances of the changes of routes effected by the opening of the canal. Detailed tabulations of distances are given in the appended tables. Reduction (in nautical miles) efected by the Panama Canul in length of all-water routes between ports of the Atlantic-Gulf seaboard of the United States and Pacific ports, American and foreign. FromPortos Ne -ali. Nor-Ch -.JackPort PenMoNew GalRemarks. an Yr. odelore. folk. toin. Ire a. -Ta1, sacola. bile. Vc (Me.). 'oilorlc pia. vile, pa.las ol Sitka. 7,663 7,676 7,873 7,948 8,020 8,020 8,234 8,267 8,301 8,748 8,821 8,834 8,868 8,1940 ViaSanFrancisco. Di'erencebetween Panamna and 1Kagellan routes. Port Town7,663 7,676 7,873 7,948 8,020 8,020 8,234 8,267 8,301 8,748 8,821 8,834 8,868 8,940 Do. send. Portland,Oreg 7,663 7,676 7,873 7,948 8,020 8,020 8,234 8,267 8,301 8,748 8,821 8,834 8,868 8,940 Do. San Francisco. 7,663 7,676 7,873 7,948 8,020 8,020 8,234 8,267 8,301 8,748 8,821 8,834 8,868 8,940 Do. San Diego. 7,673 7, 686 7,883 7, 958 8, 030 8,030 8,244 8, 277 8, 311 S,758 8,831 8,844 8,878 8,930 Do. Acapulco.-.7,871 7,884 8,081 8,156 8,228 8,228 8,442 8,475 8,509 8,956 9,029 9,042 9,076 9,148 Do. 0 San Jose de 8, 125 8,138 8,335 8,410 8,482 8,482 8,696 8,729 8,763 9,210 9,283 9,296 9,330 9,402 Do. Guatemala. Honolulu. 6,400 6,413 6,610 6,685 6,757 6,757 6,971 7,004 7,038 7,485 7,558 7,571 7,605 7,677 Do. Guayaquil. 7,195 7,208 7,405 7, 480 7,552 7,552 7,766 7, 799 7, 833 8, 280 8,353 8,366 8,400 8,472 Do. Callao. .-.6,040 6,053 6,250 6,325 6,397 6,397 6,611 6,644 6,678 7,125 7,198 7,211 7,245 7,317 Do. Iquique. 4,929 4,942 5,139 5,214 5,286 5,286 5,500 5,533 5,567 6,014 6,087 6,100 6,134 6,206 Do. Valparaiso. 3,537 3,550 3,747 3,822 3,894 3,894 4,108 4,141 4,175 4,622 4,695 4,708 4,742 4,814 Do. Coronel. 3,086 3,099 3,296 3,371 3,443 3,443 3,657 3,690 3,724 4,171 4,244 4,257 4,291 4,263 Do. Yokohama. 3,353 3,435 3,768 3,938 4,116 4,116 4,575 4,649 4,771 5,581 5,658 5,671 5,705 5,777 Differencebetween routes viaPanama, San Francisco, and Great Circle, and via SueZ, Colombo, Singapore, hongkong, and Shanghai Shaighai. 1,461 1,543 1,876 2,046 2,224 2,224 2,1683 2,757 2,879 3,693 3,766 3,779 3,813 3,885 DiTerencebetween routes via Panama. n San Francisco, Yokohama, andl via Suez, Colombo, Singapore, and HongZ kong. Ilongkong. 1-433 1-351 1-18 152 330 330 789 863 985 1,799 1,872 1,885 1,919 1,991 DkTerencebetweenroutes via Panama, San Francisco, Yokohama, and Shanghai, and via Suez, Colombo, and Singapore. Ianila.'. 1-374 1-292 41 211 389 389 848 922 1,044 1,858 1,931 1,944 1,978 2,050 Diierence between routes via Panama San Francisco, and Yokohama, andI I via Suez, Colombo, and Singapore. Adelaide.1,424 1,483 1,746 1,873 2,000 2,000 2,352 2,412 2,489 3,138 3,211 3,224 3,238 3,330 Diilerencebetweenroutes via Panama, Tahiti, Sydney, and Melbourne, and via St. Vincent and Cape of Good Hope. Melbourne. 2,448 2,507 2,770 2,897 3,024 3,024 3,376 3,436 3,513 4,162 4,235 4,248 4,282 4,354 Di-Terence between routes via Panama, Tahiti and Sydney, and via St. Vincent, dape of Good Hope, and Adelaide. Sydney. 3,610 3,669 3,932 4,059 4,186 4,186 4,538 4,598 4,675 5,324 5,397 5,410 5,444 5,516 Di-ierence between routes via Panama and Tahiti and via St. Vincent Cape a of Good Hope, Adelaide, and Melbourne. Diference between routes via Panama Wellington.2,283 2,296 2,493 2,568 2,640 2,640 2,854 2,887 2,921 3,368 3,441 3,454 3,488 3,560 and Tahiti and via Straits of MagelH lan. 1 Distance less via Suez. Reduction (in nautical miles) efected by the Panama Canal in distances from European ports to the ports of the west coast of A merica and to New Zealand. From0 To-Liverpool. hamburg. Antwerp. Bordeaux. Gibraltar. Remarks. DisLess via DisLess via DisLessvia DisLessvia DisLess via tance. Panama. lance. Panama. tance. Panama. tance. Panama. stance. Panama. Sitka. Magellan. 14,804 5,666 15,185 5,528 14,923 5,528 14,564 5,376 13,873 4,950 Via San Francisco. ranama.-. 9,138 9,657 9,395 9,188 8,923 Port TownMagellan. 14,272 5,666 14,653 5,528 14.391 5,528 14,032 5,376 13,341 4,950 Do. send. Panama. 8,606 9,125 8,83 8,156 8,391 Portland, Magellan .14,152 5,666 14,533 5,528 14,271 5,528 13,912 5,376 13,221 4,950 Do. Oreg. Panama. 8,486 9,005 8,743 8,536 8,271 SanFrancisco. Magellan. 13,502 5,666 13,883 5,528 13,121 5,528 13,262 5,376 12,571 4,950 Panama. 7,836 8,355 8,093 7,886 7,621 San Diego. Magellan. 13,110 5,676 13,491 5,538 13,229 5,538 12,870 5,386 12,179 4,960 Panama. 7,434 7,953 7,191 7,484 7,219 Acapulco. Magellan. 11,891 5,874 12,272 5,736 12,010 5,736 11,651 5,584 10,9G0 5,158 Panama.-. 6,017 6,536 6,274 6,067 5,872 San Jose do Magellan. 11,605 6,128 11,986 5,990 11,724 5,990 11, 365 5,838 10,674 5,412 Guatemala. Panama. 5,477 5,996 5,734 5,527 5, 262 Honolulu. Magellan. 13,679 4,403 14,000 4,265 13,758 4,265 13,439 4,113 12,748 3,687 Panama. 9,276 9,795 9.533 9,326 9,061 Guayaquil. Magellan. 10,582 5,198 10,963 5.060 13,701 5,060 10,342 4.908 9,651 4,482 Panama. 5,384 5,903 5.641 5,434 5,169 Callao. Magellan. 9,980 4,043 10,361 3,905 10,G09 3.905 9,740 3,753 9,049 3,327 Panama.5,937 6, 456 6, 194 5,987 5,722 Iquique. Magellan. 9,510 2,932 9,891 2,794 9,629 2,794 9,270 2,042 8,579 2,216 Panama. 6,578 7,097 6,835 6,628 6,363 Valparaiso. Magellan. 8,747 1,540 9,128 1,402 8,866 1,402 8,507 1,250 7,816 824 Panama. 7,207 7,726 7,464 7,257 6,992 Coronel. Magellan. 8,502 1,089 8,883 951 8,621 951 8,262 799 7,571 373 Panama. 7,413 7,932 7,670 7,413 7,198 Wellington. Suez. 12,989 1,564 13,353 1,409 13,091 1,409 12,732 1,257 11,702 489 Suez route via Aden, Colombo, King George Sound, and Melbourne. Panama. 11.425 11,944 11,682 11.475 11,213 Panama route via Tahiti. 20 OFFICIAL HANDBOK OF PANAMA CANAL. level channels and Gaillard (formerly Culebra") Cut the speed of vessels is limited to 6 knots; through Gatun Lake they may make 10, 12, and 15 knots, according to the width of the channel. A vessel may clear from the canal port at which it enters and, after passing through the last of the locks, put direct to sea without further stop. The handling of a vessel all through the canal, except in the locks, is essentially the same as its handling through any charted channel where observance of signals, ranges, and turns is necessary. The canal channel throughout is very accurately charted, fully equipped with aids to navigation, and governed by explicit rules with which the pilots, of course, are thoroughly familiar. In the locks, the vessel is under the control of the lock-operating force. As the vessel approaches the locks, the operator in charge at the control house indicates by an electrically operated signal at the outer end of the approach wall if the vessel shall enter the locks, and, if so, on which side; or if it shall keep back or moor alongside the approach wall. If everything is ready for the transit of the locks, the vessel approaches the center approach wall, which is a pier extending about a thousand feet from the locks proper, lines are thrown out, and connections are made with the electric towing locomotives on the approach wall. The vessel then moves forward slowly until it is in the entrance chamber, when lines are thrown out on the other side and connections are made with towing locomotives on the side wall. Six locomotives are used for the larger vessels, three on each wall of the lock chamber. Two keep forward of the vessel, pulling and holding her head to the center of the chamber; two aft, holding the vessel in check; and two slightly forward of amidships, which do most of the towing of the vessel through the chamber. The locomotives are powerful affairs, secured against slipping by the engagement of cogs with a rack running along the center of the track, and equipped with a slip drum and towing windlass, which allow the prompt paying out and taking in of hawser as required. No trouble has been experienced in maintaining absolute control over the vessels. OFFICIAL HANDBOOK OF PANAMA CANAL. 21 The water within the lock chamber proper, beyond the entrance chamber, is brought to the level of that in the approach, the gates toward the vessel are opened, the fender chain is lowered, and the locomotives maneuver the vessel into the chamber and bring it to rest. The gates are then closed, the water raised or lowered, as the case may be, to the level of that in the next chamber, the gates at the other end are opened, and the vessel moved forward. Three such steps are made at Gatun, two at Miraflores, and one at Pedro Miguel. When the vessel has passed into the approach chamber at the end of the locks, the lines from the towing locomotives on the side wall are first cast off, then those from the locomotives on the approach wall, and the vessel clears under its own power. Towing is not ordinarily required in any part of the canal, except in the locks, for steam or motor vessels. Tug service for sailing ships or vessels without motive power is at the rate of $15 per hour. If the channel in the Cut has been disturbed by a slide, tugs may be used to handle vessels past the narrow places, but in such cases there is no charge for the service to vessels of less than 15,000 gross tonnage. ....GATUIN SPILLWAY DAM. OPENING OF SEVEN GATES, LOOKING WEST FROM EAST ABUTMENT, DECEMBER 30, 1913. OFFICIAL HANDBOOK OF PANAMA CANAL. 27 Coal.-At Cristobal, from lighters, trimmed in bunkers, or from cars alongside wharf, handled by ships' gear, per ton, $5.40; use of steam hoist and crane, per hour, $1. At Balboa the price is $1 more per ton, either form of delivery. Fuel oil.-Regular sales, $1.25 per barrel. Water.-Delivered at dock, 25 cents per 1,000 gallons; minimum charge, $3. General supplies, foodstufs, etc.-Prices are usually less than retail prices in the United States. Wholesale lists may be obtained from the offices of the port captains. Ice.-At Cristobal, 30 cents per 100 pounds; at Balboa, 35 cents per 100 pounds. Laundry.-The following representative prices will give a fair idea of charges. For passengers: Drawers or undershirts, 10 cents each; socks, 5 cents per pair; collars, 3 cents each. For ships: Waiters' coats, 10 cents each; blankets, 10 cents each; trousers and jackets, 5 cents each; aprons, caps, sheets, tablecloths, napkins, towels, 1 cent each. CHARGES FOP, SERVICES. Barges and lighters.-With towing machine, 400 tons or over, $2.25 per hour; without towing machine, 400 tons or over, 90 cents per hour; under 400 tons, 30 cents per hour. The charge for barges or lighters will depend upon the kind and class of service rendered, time in use, and charges in connection with handling freight and cargo. JIWharfage.-All steam or motor vessels, per day or fraction thereof, per foot of length, measured over all, 121 cents. Sailing vessels, 100 feet in length or less, per foot, 5 cents; over 100 but less than 200 feet, per foot, 10 cents; over 200 feet, per foot, 124 cents. Dry docking at iount Hope.-For vessel docked alone, $75 for the first day, and $25 for each subsequent day. For a vessel docked with another vessel, $50 for the first day, and $18 for each subsequent day. Launches.-Larger launches, for the first hour, $7.50, and $5 for each succeeding hour; smaller launches, $5 for the first hour, and $2.50 for each succeeding hour. 28 OFFICIAL HANDBOOK OF PANAMA CANAL. Diver's service.-For the first four hours or fraction thereof from time of arrival at point of diving $60, for each subsequent hour $10. Freight.-Rates for handling freight depend upon the kind and class of services required. Freight is handled at the terminal ports either by the Panama Railroad or the agents of vessels. Tugs.-For, harbor work, shifting berths, work around piers or locks, and short tows, $15 per hour. For towing through the canal 4 cents per displacement ton, or 10 cents per net Panama Canal ton; minimum charge for towing through the canal $150. Pi.otage.-Charges are based upon the maximum draft; rate per foot or fraction of foot exceeding 6 inches $1. In ,case pilot is taken on outside of the Atlantic breakwaters an extra charge of $10 is imposed. There is no charge for pilotage when a vessel goes direct through the canal without stopping at either terminal port to take on or discharge cargo or passengers. Through passengers will be allowed to land without affecting the status of the vessel in this respect. Tolls.-On merchant vessels carrying passengers or cargo per net ton (each 100 cubic feet) of actual earning capacity $1.20. On vessels in ballast without passengers or cargo, per ton, 75 cents. On naval vessels, other than transports, colliers, hospital ships, and supply ships, per displacement ton, 50 cents. 'On Army and Navy transports, colliers, hospital ships, and supply ships, the vessel to be measured by the same rules as are employed in determining the net tonnage of merchant vessels, per net ton, $1.20. Additional charges are made for deck loads, depending on the space occupied; per net vessel ton, $1.20. For passengers, no specific charge is made, but passenger space is included in the net tonnage upon which tolls are charged. 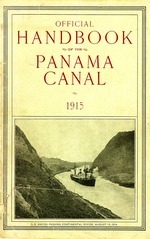 32 OFFICIAL H1IANDBOOK OF PANAMA CANAL. through the canal, an idea of the saving may be obtained from the case of one of the American Hawaiian Co.'s liners, the Arizonan, for instance: On the basis of a speed of 12 knots, the canal saves the Arizonan about 26.8 days at sea on each voyage from coast to coast. The Arizonan is a relatively large vessel, 470 feet long by 57.2 feet in the beam, and has carried as much as 11,780 tons of cargo through the canal on one of her voyages. The canal tolls levied on each passage are $7,891.20. The cost of operating the Arizonan at sea may be taken at $450 a day. For 26 days this means $11,700, from which the subtraction of the tolls leaves a net saving of approximately $3,808 per voyage. Similar instances might be cited without end. Those given are indicative of the great element of saving which will be introduced into some of the more important routes. 38 OFFICIAL HANDBOOK OF PANAMA CANAL. greater importance, admitting of less certainty iii its determination, is the relative time which it will take a sailing vessel to reach the Isthmus and its ultimate destination, in comparison with the passage over the longer alternative routes around the Horn or the Cape of Good Hope. On the Atlantic side, according to sailing directions, the time of transit of an average sailing vessel between New York and the Isthmus may be approximated at 20 days. The time from the English Channel to the Isthmus is reckoned as 30 days for a yearly average; the homeward voyage to Europe is taken at 40 days. Limon Bay is easily accessible to sailing vessels at all times of the year and vessels -may generally expect a fair wind for entering. On the Pacific side vessels may generally expect a fair wind offshore on -departing from the Isthmus, light from May to November, and somewhat stronger from December to April. Vessels entering the Gulf of Panama will almost invariably encounter head winds, often very light, and find difficulty in beating up to the canal. Off shore on the Pacific side the regular trades may not be expected until several hundred miles off shore. Sailing directions should be freely consulted by all sailing masters, particularly in regard to the wind and currents on the Pacific side. If due notice be given, tugs may be obtained from the canal authorities. The average time of a sailing vessel from Panama to San Francisco is considered to be between 37 and 40 days; for the return about 31 days from April to October, and 26 days from October to April. Accordingly the time of transit of a vessel from New York to San Francisco may be reckoned generally at 60 days, including a day in the canal. The return trip should consume about 57 days in the winter months and 62 in the summer season. The generally accepted average time for sailing vessels to go from New York to San Francisco around Cape Horn is 140 days; the return voyage requires from 110 to 115 days. On this basis the normal time for a round trip between the two ports by way of the canal may be rated at 120 days: by way of the Horn about 250 days. PEDRO MIGUEL LOCKS. DREDGING FLEET PASSING FROM EAST CHAMBER INTO GAILLARD CUT ON WAY TO CUCARACHA SLIDE, DECEMBER 2, 1913. 40 OFFiCIAL HANDBOOK OF PANAMA CANAL. The extent to which sailing vessels will use the canal will be dependent on many conditions in the shipping world, but it appears that under normal conditions the canal route is favorable to them. For instance, on the voyage from New York to San Francisco under average conditions a vessel might be expected to save 80 days at sea. Shipowners state that a vessel of 2,000 tons net may be operated at sea at a cost of $75 per day. The charges for passing such a vessel through the canal would approximate $2,700. If these charges be subtracted from the saving of 80 days at sea, at $75 per day, or ,.000, the net saving to the operator would be $3,300. In the case of such a vessel the saving of 36 days at sea would cover its canal expenses. Between this period and the normal expectation of saving by way of the canal, 80 days, is a leeway of 44 days: that is, if the operator used the canal and then had his vessel arrive 44 days late, as compared to the normal voyage over the route, he would still break even." If the vessel arrived 30 days late over the normal time. he would be benefited to the extent of 14 days at sea, which, at $75 per day, is equivalent to $1,050. -a PEDRO MIGUEL LOCKS. LOCKAGE OF 85-FOOT PILES RAFTED FROM BALBOA TO EAST BREAKWATER, ATLANTIC ENTRANCE, LOOKING SOUTH FROM CONTROL HOUSE, APRIL 8, 1914. OFFICIAL HANDBOOK OF PANAMA CANAL. 45 which is situated on the east side of the spillway discharge channel. When all the gates are open the discharge of water is greater than any known rate of run-off from the Chagres watershed. Dropping down the 60-foot slope of the ogee and striking against the baffle piers at the bottom, the water makes a turbulent fall which is one of the beautiful sights of the Isthmus. The hydroelectric station uses water from Gatun Lake for driving three turbo-generators of 2,000-kilowatt capacity each, which supply electricity for the operation of the lock and spillway machinery, the terminal shops and adjacent facilities, and for the lighting of the locks and the canal villages and fortifications. Transmission over the Zone is effected through four substations and a connecting high voltage transmission line which follows the main line of the Panama Railroad. Gatun Lake, impounded by Gatun Dam, has an area of 164 square miles when its surface is at the normal elevation of 85 feet above sea level, and is the largest artificially formed lake in the world. The area of the watershed tributary to the lake is 1,320 square miles. During the rainy season, from April to the latter part of December, the run-off from this basin exceeds considerably the consumption. of water, and the surplus is discharged through the spillway of Gatun Dam. Toward the end of the rainy season the surf ace of the lake is raised to about 87 feet above sea level, in order to afford a surplus or reserve supply to keep the channel full to operating depth during the dry season, in part of which the consumption and evaporation are in excess of the supply. It is calculated that when this level has been attained at the beginning of the dry season the reserve is sufficient to assure a surface elevation of at least 79 feet at the end of the dry season in spite of the consumption at the hydroelectric station, and allowing 41 passages of vessels through the locks each day with the use of the full length of the chambers, or 58 lockages a day when the shorter sections of the chambers are used and cross filling is employed, which woidd usually be the case. This is a greater number of lockages than can be made in one day. --W LM MIRAFLORES LOWER LOCKS. LOWER MAIN GATES, JULY 5, 1913. 50 OFFICIAL HANDBOOK OF PANAMA CANAL. into the chambers through lateral culverts running under the floors of the chambers and emptying upward. The culverts are controlled by valves. In all 92 leaves, forming 46 gates of two leaves each, are ,sed in the three sets of locks. Each leaf is 65 feet long, so that when two are swung together to form a closed gate they meet in the center of the 110-foot width at an obtuse angle. The leaves are so set that this junction always points upstream against the downward pressure of the water: this pressure accordingly forces them firmly together and affords an element of safety, since a gate can not be opened until the water on both sides has been equalized. The leaves range from 47 to 82 feet in height, according to location, and they weigh from 390 to 730 tons each. The 82-foot gates occur only at the lower end of Miraflores Locks, where they are necessary on account of tidal conditions. The leaves are hinged to anchorages in the walls and are swung back and forth like ordinary gates. They are moved by machines driven by electric motors. In fact, every piece of mechanism in the locks is actuated by electricity, and this has made possible a central control by which an operator at a central switchboard can cause every movement of the lock equipment except the running of the towing locomotives, which are under the control of individual operators riding on them, and the handling of the emergency dams. 52 OFFICIAL HANDBOOK OF PANAMA CANAL. canned fruit and fish, lumber, wine, pineapples, sugar, ores, and other items of the general produce of the west coast and adjacent inland areas. The return leg of this trade, from the Atlantic to the Pacific coast of the United States, has consisted principally of coal, structural iron, machinery, and, above all, a great variety of merchandise. Some idea of it may be gained from the following note, which appeared in the Canal Record of March 24, 1915: As an example of the great variety of goods carried in the westbound United States coastwise trade, it is interesting to note some of the items in the cargo of 4,500 tons carried by the P~cter H. Croiueli through the canal March 10 on the way from New York to Los Angeles and San Francisco. Among the items listed by the master on the partial cargo declaration form supplied by The Panama Canal were: Battery cells, caustic soda, olives, chemicals, earthenware, glassware, lard, liquors, structural steel, machinery, refined petroleum, vegetable oils, paint, paper and paperware, pianos, rubber goods, salt, soap, stamped ware, textiles, tobacco, wooden ware, marble, starch, and thread; and the declaration was finished with Balance, 1,180 tons, smoll lots of various articles." From the west coast of the United States and Canada to Europe, over half the traffic ivas in grain, and the balance was in the same sort of general produce which constitutes the bulk of the eastbound American coastwise trade. Forty-four vessels carried western grain to Europe during the first six months of canal operation. They transported 155,146 tons of wheat and 134,145 tons of barley. Expressed in bushels the quantities were 5,752,402 bushels of wheat and 6,170,670 bushels of barley, an aggregate of over 11,923,000 bushels of grain. The trade from Europe direct to the west coast has been about one-seventh that from the west coast to Europe. The cargo has been mostly coal and those sorts of general merchandise which make up the bulk of the trade from the Atlantic coast of the United States to the Pacific coast. Numbers of vessels have gone through the canal empty or in ballast" from the Atlantic to load with cargo on the Pacific coast and return. This was especially noticeable at one time in the traffic in grain. -r-~, MIRAFLORES LOCKS. S. S. ADVANCE GOING SOUTH ON TRIP THROUGH CANAL. SPILLWAY IN FOREGROUND, LOOKING WEST, AUGUST 9, 1914. 54 OFFICIAL HANDBOOK OF PANAMA CANAL. The traffic from the west coast of South America to the Atlantic coast of the United States has had as its largest single item nitrates. Of this item, 204,441 tons were shipped through the canal during the first six months of operation, the greater part going to the United States. Iron ore has been another important item, amounting in the period to 41,300 tons. Other items distinguished by their size were fuel oil and benzene, amounting to 10,799 tons, and sugar. about 18,000 tons, of which 13,360 tons came through in two ships. In addition to these, there was an export of about 100,000 tons of general cargo, a great variety of native produce, in which ores, wool, hardwoods, and grain are noteworthy. The traffic to South America through the canal during the first six months was less than one-half of the exportations frcm the west coast which passed through the canal. The 31 laden vessels which made the transit on their way to the west coast carried 128,922 tons of cargo. This was mainly machinery, structural material, clothing, and a great variety of general merchandise. Shipments from the Atlantic coast of the United States to the Far East included 87,857 tons of refined petroleum and other petroleum products, 38,239 tons of raw cotton, and 162,686 tons of a great variety of manufactured goods, of which machinery, structural steel, railroad material, and textiles have been considerable items. About half of these vessels cleared for Australia and New Zealand, the rest for Japan, China, and Vladivostok. The trade to Vladivostok has been unexpectedly heavy. During the first six months only two vessels returned through the canal directly from the Far East. Most of the vessels which go out over this route load in the Far East for ports in Europe or return first to the Pacific coast of North America, discharging cargo there and reloading. The cargo coming through the canal from the Far East has included Chinese groceries, matting, antimony, vegetable oils, curios, rattan, bamboo, silk, tallow, tea, wool, etc. The routes just described were used by all but 13 of the vessels passing through the canal during its first half year. OFFICIAL HANDBOOK OF PANAMA CANAL. 55 The 13 miscellaneous vessels not to be classified with the principal routes included 4 vessels of a whaling fleet, on the way from Magdalena Bay to Norway; several stray vessels in the Central American coasting trade, and several vessels carrying coal to undeclared destinations. The half dozen leading commodities shipped through the canal during the first half year were, in order of their tonnage, grain, nitrates, coal, refined petroleum products, lumber, and cotton. These six commodities together amounted to approximately one-third of all goods shipped through the canal. Grain shipments amounted to 303,124 tons, of which all but 13,733 tons were shipped from the west coast of the United States and Canada. Of the other 13,733 tons, 6,200 tons were barley shipped from Valparaiso to Great Britain and 7,533 tons were wheat shipped from St. Johns, New Brunswick, to New Zealand. The grain shipments from the west coast of North America consisted of 155,246 tons of wheat (5,744,000 bushels) and 134,145 tons of barley (6,170,000 bushels), a total of approximately 11,914,000 bushels. Nitrates shipped from the west coast of South America to various ports in the United States and Europe amounted to 204,441 tons. Coal, all moving to the Pacific, amounted to 151,745 tons. Of this quantity, 83,081 tons were shipped from the Atlantic seaboard of the United States and 68,664 tons from the United Kingdom. Refined petroleum and other products amounted to 102,456 tons, of which 87,857 tons were shipped from the Atlantic seaboard of the United States to China, Japan, and Korea, and 14,599 tons were shipped from Talara, Peru, to Great Britain. Shipments of lumber amounted to 56,078 tons. All but 600 tons (shipped from Gulfport to Panama City) were from the west coast of North America. Of the 55,478 tons shipped from the west coast all were shipped from ports of the United States except 6,891 tons from Nanaimo, British Columbia. 56 OFFICIAL HANDBOOK OF PANAMA CANAL. Raw cotton shipments amounted to 38,239 tons, en route from the Atlantic seaboard of the United States to the Far East. Over 70 per cent of the cotton passing through the canal was consigned to Japan. The total cargo handled through the canal in its first half year was 2,367,244 tons. In the month and a half after February 15 nearly 1,000,000 tons more of cargo went through the canal, and the total up to April 1 was 3,246,019 tons. Its proportionate distribution over the principal. routes is about the same, as shown in the following tabulation: Vessels. Tonnage. tontae. United States coastwise, eastbound--------------------137 650, 921 United States coastwise, westbound---------------------182 616, 872 1, 267, 793 North Pacific coast to Europe. 3 620,988 Europe to North Pacific coast .-----21 6S,043 South and Central America to United Statesand Europe 103 503,812 United States and Europe to South and Central America. 53 103, 330 784,142 Atlantic coast to Far East-------------------. 62 373,097 Far E ast to A tlantic coast. .6 4 00 418,197 Miscellaneous routings.---------------------------------16 .86,856 Vessels without cargo.------------------56 .. Grand total ---------------------.-.-. 679-. 3,246,09 Up to April 1, 1915, the canal had been in operation seven and a half months. Through that period the movement of cargo averaged 432,802 tons a month, which is at the rate of over 5,000,000 tons a year. An expression of this quantity in terms of railway traffic is illuminating. During the fiscal year ending June 30, 1914, the Panama Railroad handled 643,178 tons of through freight between the seaboards of the Isthmus. During that year the railroad was supposed to be handling more freight per mile of track than any other railroad in the world. It will be noted that the through traffic of the Panama Railroad that year was within 9,000 tons of the amount carried through the canal during the month of March, 1915 (which was 635,057 tons) ; in other words, that the canal has handled in a month almost as much as the railroad did during a year. 58 OFFICIAL HANDlOK OF PANAMA CANAL. Tie trains of the Panaia Railroad eng-aged in hauling through freigHit were made rip of from 18 to 20 loaded cars, carrying ini the atgrtQettV :loHiit :)0 tons. To handle 5,000,000 tons of calrgo across the Istlulls in a year by rail would require the operatic of : trains a day. It would mean dispatchinii a trai iia eai way everv hour and a quiarter. and trains passing a giveii pot about every 40 miniiites throtigh every hoiof the veai. i Th 14.28. trains necessary for handling this traffic would uaye. at 800 feet encl, an aggregate length of over 2,142 miles. greater than the distance from New York to Colon. III a single train the cars would reach from New York to Chiicago and back, or from New York to Cicano m(d then down to New Orleans. and leave several hundred miles of train to spare. During the mithi of' March. 1915. the laden vessels going through the caial I1aI an average of 5.040 tons of cargo. Thus the vessels conta iid. oil aI average, over 14 trainloads of goods each. The locoiotiyes aid tr ils of the Panama Railroad are about the a Ventiy iII freight work. A comparison in the maximum terms ol railw \vayV t raflic is afforded hy the trial trip made last year by what was called the world's largest locomotive, the Matt II. Shamy," of the Erie Railroad. This was termed three engines in one," and on its trial trip handled a train of 55 cars of coal. said to have been the heaviest train ever ha led from Baltimore to Philadelphia by one locomotive. This train carried 4.012 tons. whiich is less than the average load on each sip going through the canal.